In our kitchen, you can imagine, we’ve got a fair few power guzzling pieces of equipment – big ovens, blast chillers, fridges, freezers and more – so we use quite a lot of electricity. We need this to make our products but it isn’t something we’re comfortable about given how much we value the environment and worry about climate change. Back in 2014 we made some commitments to improve the sustainability of our business. Among these was reducing our reliance on fossil fuels, working with responsible suppliers and working to responsible environmental and social values. So last year, as part of this commitment, we decided to switch our energy supplier to Ecotricity . We felt the time had come to put our money where our mouth is and swallow any slightly higher costs for the electricity we use, knowing that we would be powering our business more sustainably and lessening the impact our business has on the planet. People are at last beginning to sit up and take notice about the threat to our world by our endless and often thoughtless consumption of nature’s resources. It has taken some well chosen words by Sir David Attenborough to drive this home, but many of us have been aware of this for years without necessarily doing anything about it (or doing enough anyway). So we think it’s time to shout about this commitment that we’ve made and we’re even happier to shout now that we can say that by powering our business with Ecotricity we are not only reducing our reliance on fossil fuels but are running our kitchen on animal-free energy. What does this mean? Well you can read more about it here, but in essence, Ecotricity is the only energy supplier in the UK registered with The Vegan Society for their green electricity and green gas. All energy sources that go into making their electricity and gas have been verified, to ensure the company isn’t inadvertently using animals in its energy production. 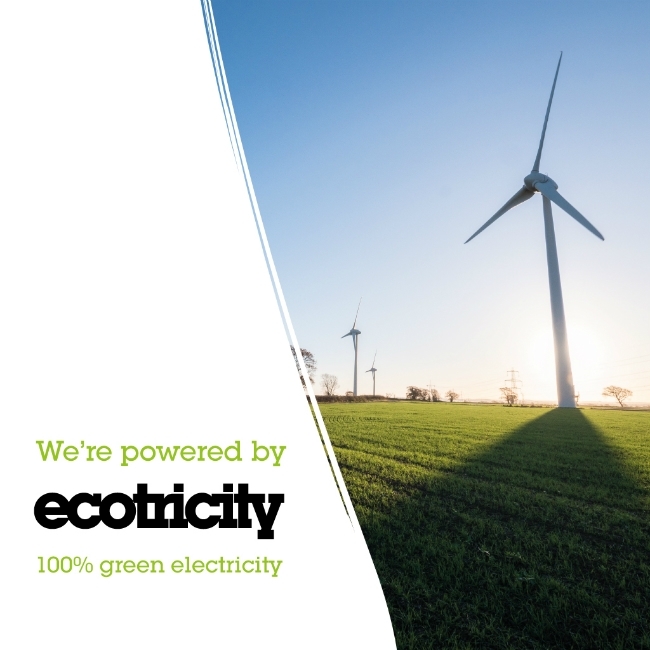 We haven’t got the time to monitor any differences there are between Ecotricity’s prices and other energy suppliers on an ongoing basis – we checked at the time we switched and the differences weren’t all that much – but guess what – we don’t care!! What we do care about is that we are doing something, in a small way to reduce our impact on the planet, and we’re using a responsible energy supplier. With any luck, by spreading the word, we can encourage others to do the same….yes, that’s you!